Since the inception of our company, we manufacture and supply the premium quality of Cardboard Corrugated Boxes. The corrugated boxes are used in packaging industry. 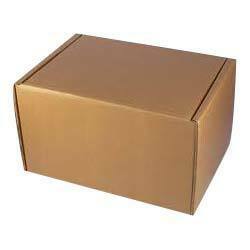 Our customers can avail the offered corrugated boxes in both customized and standardized sizes. Challenge Packaging Industries started it business in the year 2007 as a Partnership based firm. We have located our operational office at Chennai, Tamil Nadu (India) and indulged in manufacturing and supplying wide range of products. The products range includes Printed Box, Corrugated Box, Packaging Box, Corrugated Roll, Corrugated Sheet and many more. In our organization, we have hired a team of dedicated and devoted personnel that put their immense efforts while performing their work. In the production unit, they use latest technologies and excellent quality material with an aim to have quality products in the industry. The material which they use is procured from the best and reliable vendors of the market. Our vendors have created a reputed position in the market. Further, we make sure that the products are quality approved by our analyst under the various parameters. Our quality auditors are highly experienced and knowledgeable in their respective domain. They put their full dedication and hard work while testing the quality of the products. Moreover, the offered ranges are as per the preference and demands of our valuable customers. We make sure that the products must satisfy the customers in a best possible manner. Thus, we have created a renowned position in this competitive market.